We are delighted to return to the ever popular Grecotel Daphnila Bay Hotel to once again host our Summer Corfu tennis weeks. Over-looking the beautiful Dassia Bay and Ionian sea, it’s no wonder the Daphnila Bay is a haven for our Solos tennis guests. The island of Corfu, off the coast of mainland Greece, is a favourite amongst Solos holidaymakers, with its landscapes of olive and cypress groves, plus a picturesque coastline with lovely beaches and crystal clear water. The most northerly of the Ionian Islands, Corfu is also one of the most traditional. This island’s charm and beauty has captivated Solos for decades and remains as exciting as ever. We include a 5 day programme of organised tennis, with friendly and competitive games arranged by our Solos Tour Leader. The hotel has a superb range of facilities including hard surface (quartz sand) tennis courts. If you are still feeling sporty you can choose between all the water and land activities on offer - from the quiet canoes and pedal boats to mountain bikes and table tennis, we are sure to be kept busy. Or why not visit Corfu Town or even go further afield on a day trip to Albania? Take time off from the courts and explore the coastline on a cruise to San Stefano and Kalami, famous for Durrells’ ‘White House’ and its beautiful beach. I had a wonderful two weeks of tennis and relaxation at the Daphnila Bay Hotel. The Tour Leader approached everything with professionalism and the right amount of humour. Tennis facilities were very good, as were the hotel and location. I would definitely go again, a brilliant holiday! Great tennis week in Corfu which was excellent and thoroughly enjoyable. Big thank you to our Tour Leader who was excellent, looked after us all and made sure everything went smoothly. 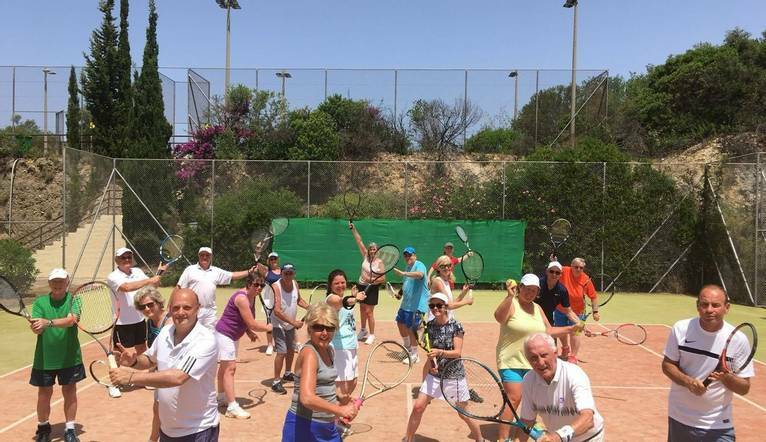 The service and hosting was excellent and the holiday as a whole comprised a really great group of people looking to enjoy their tennis together in a fabulous environment. Nothing was too much trouble and everyone was encouraged to get involved as little or much as they wanted. I would thoroughly recommend the whole experience to anyone wishing to travel alone. I have been on around 8 Solos holidays and have found every one of them to be well planned, organised and thoroughly enjoyable. This made travelling alone easy and safe. I had a wonderful two weeks of tennis and relaxation at the Daphnila Bay Hotel. This firm Solos favourite with lovely, well appointed rooms, offers a wealth of fantastic facilities within a beautiful beach side, picturesque location. Offering an All Inclusive board basis, along with the well equipped and superbly maintained Tennis Club on site, it is no wonder why the Daphnila welcomes back our Solos tennis players year after year. Please note that the hotel lies at the top of a hillside so there are some steps and sloping walkways down to the bungalows and the beach. There are a variety of restaurants, bars and shops around the pool and lounge area, while a shuttle bus runs between the hotel main building, the beach and beach taverna. A selection of spa treatments are available at an extra charge at the luxurious Elixir Thalassotherapy Centre. Our rooms can be found in the garden bungalows or in the main building and feature satellite TV, a telephone, fridge, safe, air-conditioning, hairdryer and balcony or terrace. It is your own responsibility to ensure that you are fit and well enough to take part in your chosen activity holiday. The transfer from Corfu airport to the hotel is approximately 35 minutes, depending on weather and traffic.